is a full-service wildlife control company serving Brevard and Indian River and the surrounding area. We specialize in urban and suburban wildlife damage management for both residential and commercial customers. We are licensed and Insured. We handle nearly all aspects of wildlife control, and resolve conflicts between people and wildlife in a humane and professional manner. For Brevard and Indian River wildlife removal, just give us a call at 321-652-7238 and we will discuss your wildlife problem and schedule an appointment to solve it. We look forward to hearing from you. All animals are trapped and removed in a humane manner, which is what you should expect from a reputable and humane wildlife removal service. The most common wildlife removal, and animal trapping services needed are the removal of bats, birds,raccoons, removal of squirrels, removal of snakes, and geese which we expertly and professionally perform in a timely and quality manner. Whatever your needs, Florida Nuisance Trappers will consult with you and provide solutions to remove any wildlife or nuisance animal, repair the damage they may have caused, and take steps to prevent the wildlife from returning and reentering your home or property. Professional & Humane Removal: of Nuisance Wildlife including Armadillos, Bats, Raccoons, Squirrels, Skunks, Opossums, Moles, and more! Do you have an issue with a nuisance wild animal? Florida Nuisance Trappers can help! Whether it be bats, raccoons, skunks, squirrels, moles or any number of other animals, we have the experience to provide a solution. Florida Nuisance Trappers is a local, owner-operated nuisance animal removal company serving the Brevard county area (palm bay, Melbourne, melbourne beachs, and more). A company that offers great customer service and quality work is what we hope to be known for. We help provide solutions to the many aspects of animal control: removal, exclusion, repair, and prevention. We provide what the animal control industry calls wildlife damage management services: basically, removing a nuisance wild animal while looking at the broader question of how the problem came to be and how we can help you prevent its recurrence. Additionally, we also make repairs and exclusions so that your home/property is returned to its pre-animal condition. What is the use of removing an animal only to have others move in? Our repairs are quality and come with a guarantee call us at anytime 24/7. All 20 species of armadillos are found in the western hemisphere. Armadillos originated in South America, and a few species have expanded northward due to their rapid breeding cycle, adaptability and a reduction of predators. The only species that has made it into the United States is the nine-banded species, which inhabits Texas and the Gulf Coast states and can be found as far north as Missouri. Armadillos prefer warm, moist climates, and thrive in forested areas and grasslands. Because they must dig for their food and shelter, they generally gravitate towards areas with loose, porous soil. These animals use their strong claws to dig several burrows throughout their home range in which to live and seek refuge from extreme weather or predators. An armadillo burrow is about 7-8" wide and up to 15 feet deep. Activity: In native southern regions, armadillos are nocturnal year-round, keeping cool underground during the day and foraging at night. However because of the armadillos' relatively low body temperature, the nine-banded species in North America tends to change its habits in the cooler months and emerge during the day to take advantage of the warm sun. Reproduction: Reproduction for the nine-banded armadillo begins in early summer, and the breeding period lasts about 2-3 months. It takes up to 4 months for a fertilized egg to become implanted and another 4 before young are born. Each time, the fertilized egg breaks into four identical zygotes, yielding quadruplets. Social Interaction: Solitary animals, armadillos spend their lives foraging alone and only interact to breed or care for their young. Young armadillos become independent about 6-12 months after they are born. Mammal Diet: Omnivore Average life span in captivity:12 to 15 yearsSize:5 to 59 in (13 to 150 cm)Weight:3 oz to 120 lbs (85 g to 54 kg)Protection status: Threatened Did you know? The nine-banded armadillo’s hapless propensity for being run over by cars has earned it the nickname “Hillbilly Speed Bump. ”Size relative to a 6-ft (2-m) man. 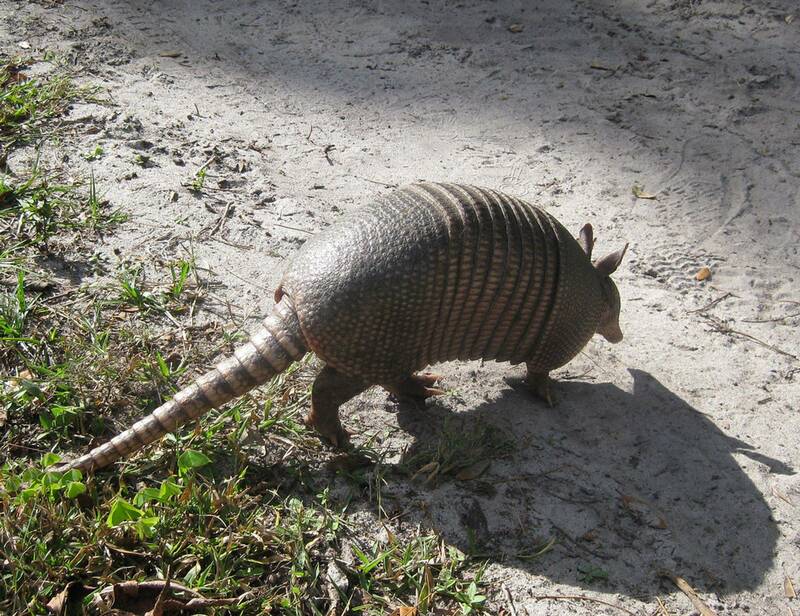 Contrary to popular belief, the nine-banded armadillo can not roll itself into a ball to escape predators!! 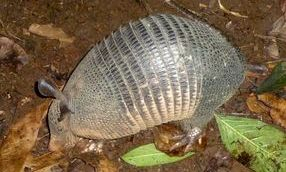 Only one of the twenty-odd varieties of armadillos — the three-banded armadillo (Tolypeutes tricinctus) — is able to roll up. The other types are covered with too many bony plates to allow them to curl up. Other armadillos have to rely on their armored shells for defense while they scuttle away through thick, thorny brush or dig themselves a hole to hide in. Nine-banded armadillos always give birth to four identical young — the only mammal known to do so. All four young develop from the same egg — and they even share the same placenta. 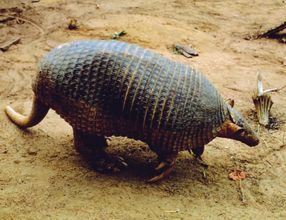 Fact 1 - Definition: An Armadillo is a burrowing, chiefly nocturnal, mammal with body covered with strong horny plates. It is a primitive terrestrial mammal with few if any teeth; of tropical Central America and South America. The body and head are encased in an armor composed of small bony plates. Fact 2 - There are several species, one of which (the peba) is found as far north as Texas. Fact 15 - The collective name for a group is a "pack" "herd" or "arrangement"
mostly found in South and Central America. 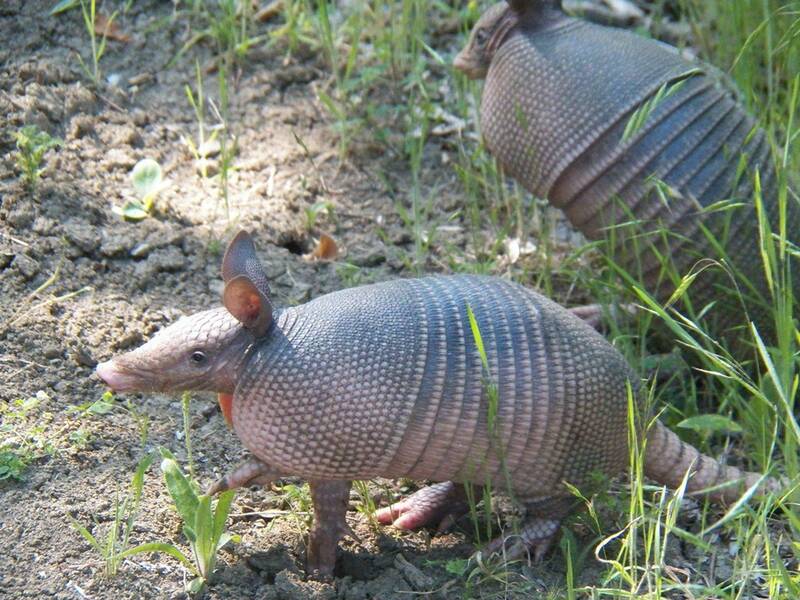 There are 20 different species of armadillos, and each one is named according to its physical characteristics. Eight prominent varieties are tagged as nine-banded armadillo, giant armadillo, large hairy armadillo, three-banded armadillo, pink fairy armadillo, six-banded armadillo, northern naked-tailed armadillo, and pichi or dwarf armadillo. The smallest variety is the pink fairy armadillo, which is 6 inches in height while the largest one is the giant armadillo which can grow up to 1.5 meters in height. The average life expectancy of armadillos is 12-15 years in captivity. Extrapolating from similar sized animals, the average life span of armadillos in the wild is estimated to be around 5-7 years. Armadillos are said to have evolved from huge, bony-shelled animals called glyptodon and panochthus. Comparatively, the present-day armadillo is smaller; however, it has retained the hard shell of its ancient counterparts. 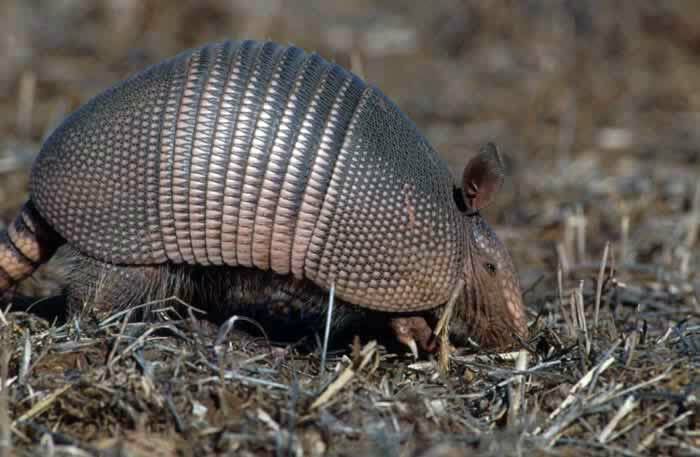 » Armadillos are the only living mammals with armor-like shells. » Armadillos have a very low body temperature that ranges between 33° C to 36° C.
» A female nine-banded armadillo can give birth to 56 pups in her lifetime, all of which are born as identical quadruplets. 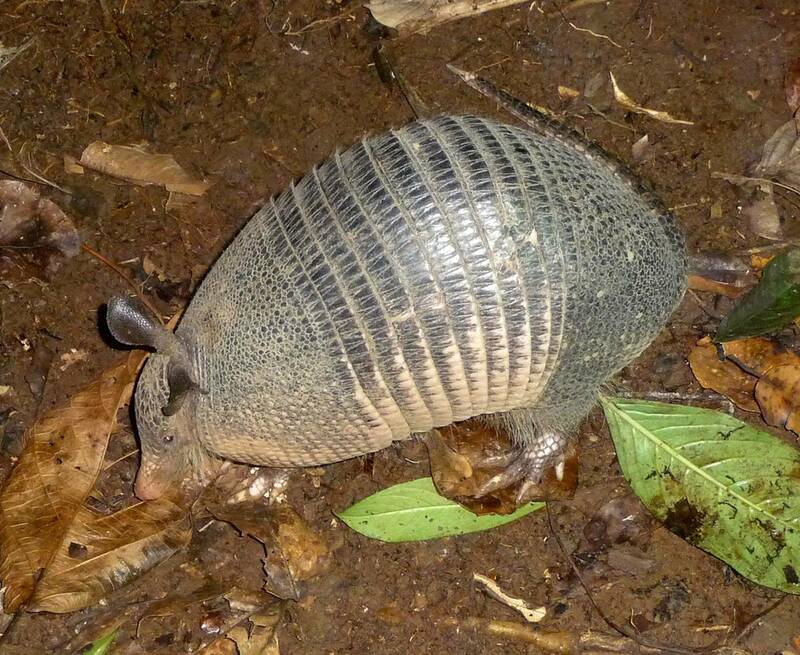 » Armadillos have a strong olfactory sense, and can smell up to 20 cm below the ground. 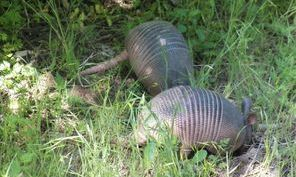 » Armadillos sleep for 18-19 hours a day and are active during the night.